Professor Logan has long held a research focus on medical anthropology, with a concentration on ethnomedicine and medicinal botany. He has worked in the American Southwest, Mexico, Guatemala, Brazil, and India. Students under his direction have completed theses and dissertations on various topics pertaining to culture and health, ones ranging from helminthic parasitization in Mexico to spiritist healing in Brazil. 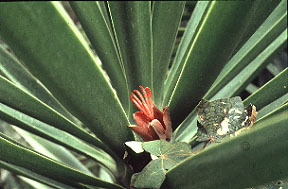 Pictured to the left is the blossom of “Macpalxochitl” (Chiranthodendron pentadactylum), which was used by the 16th century Aztec as a tonic for the heart and blood. Peoples in Mexico today use it for the same purpose. Laboratory tests have demonstrated that this plant reduces serum cholesterol levels and improves cardiac-pulmonary capacity. Students with interests in the anthropology of health are encouraged to apply to our graduate program. Funding opportunities for students in cultural anthropology are excellent.